McKenzie Mitts - The Ultimate Collectors Dream? At last I have a set of McKenzie Mitts. Have waited over 30 years to get them! They are in superb condition and are nickel plated. They are one of the 20 already known and I believe the first pair to find their way out of America. So are they the ultimate? Well they are certainly not the rarest handcuffs that exist. 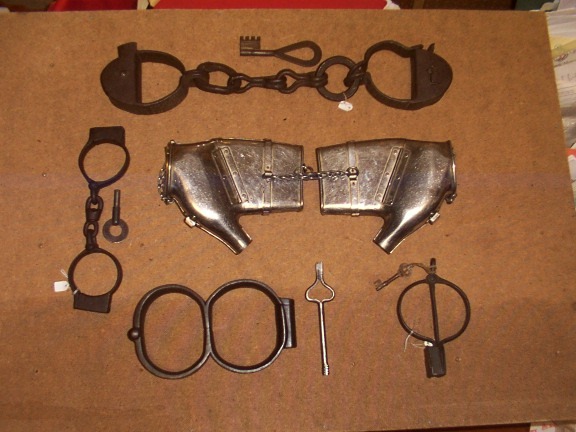 For example the Delestatius are probably 4 times rarer, the Spanish Death Penalty cuffs, Old Tower of London Pattern Wedge Lock legirons both 10 times rarer and the Hiatt Plug '8' legirons with 3 start left hand threaded key which Houdini failed to escape from 20 times rarer. Well I now think the Mitts are the ultimate - the only pair of handcuffs ever patented and produced which were too good. Their design is unique and unlike any other pattern restraint in existance. Would dearly love to hear from some of our newer collectors what they consider the ultimate addition to their collection would be.